There cannot be a bigger irony. As the nation was preparing to smugly display its military might and scientific prowess on Republic Day, a mighty earthquake flattened a large part of Gujarat. The quake, however, did not quite shake the ruling elite, who till afternoon participated in the long ceremonial parade, even as the death count continued to rise by the minute. A cabinet meeting was called at 5.30 pm , eight hours after the tragedy had struck. The extent and magnitude of the catastrophe had still not dawned on the powers that be. So much for a nuclear India coming to grips with a natural disaster that had struck a state that has a sizeable military presence. And this was just the beginning. As relief started pouring in, Indian bureaucracy was in its true element: slack, corrupt and incompetent. A low-ranking babu's signature was what was needed to download relief material from a plane waiting in Ahmedabad. But the bureaucrat was sleeping in his house, with his mobile switched off. A foreign rescue team had to wait at the Delhi airport for a frustrating 48 hours before they could get an approval from the home ministry. With crucial time being wasted, the body count made this earthquake the worst since India's independence. Above 100,000 dead, according to George Fernandes, Union defence minister. Bhuj -- which was the quake's epicentre, measuring 8.1 on the Richter scale -- resembled a town that had been bombed many times. The earthquake, which lasted for a minute, instantly turned homes to tombs in this town of 150,000 people, 90 per cent of whose houses have been reduced to rubbles. Those who survived did not know whether to thank God for being alive or cry for their near and dear ones who had perished. But for sure, they were angry. As politicians and ministers made a guided tour in the affected areas, they were in for a shock. Not because of the devastation that they were about to witness, but of the rage with which the local people received them. In many cases, top politicians had to beat a hasty retreat. Not anywhere does the anger reveal more poignantly than on the face of Harilal Shah, a small-time trader in Bhuj, whose entire family has been wiped off. "The great scientists of India have planned on a mission to Moon. Why can't they use their expertise to protect their own people?," he asks. As the death toll rises to such a high that even imagination forbids, lies buried in the rubbles is the people's confidence on a system that seems inert. Leaders fight over the exact number of deaths and the scientific community debates the real magnitude. The aftershocks continue to shake the region. With it, an old question finds utterance: how many disasters will it take for the government to evolve a system that can avert large-scale death and destruction? D eath and earthquakes do not come by appointment. However, an earthquake gives definitive indications of its arrival. In Gujarat, there were many. 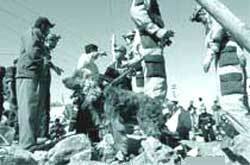 A 4.2 magnitude quake rocked the Rann of Kachhch on December 24, 2000. Its epicentre was 22 km away from Bhuj. Bhavnagar, near Bhuj, also felt several tremors before that. These tremors should have been wake-up calls for Indian scientists. But seismologists never took these tremors seriously. Similarly, the Killari earthquake of Latur in September 1993 was preceded by several tremors over a period of five months. Gujarat has a tryst with earthquakes. Every 30 years, it experiences a major one: Bhavnagar in 1872, Kachhch in 1903, Dwarka in 1940, Bharuch in 1970 and Bhuj in 2001. "If a region has a history of earthquakes, then it is earthquake prone," says R S Dattatrayan, director, seismological division, Indian Meteorological Department (imd), New Delhi. Scientists attribute frequent earthquakes to the expansion of the Indian Ocean sea floor at the rate of five centimetres (cm) every year and the rotation of the Saurashtra region in an anti-clockwise direction. Most earthquakes in India are driven by the 'under thrusting' of the Indian plate beneath the Tibetan Plateau (see box: Continental drift). It is often said that earthquake prediction is 'an unavoidable burden' for seismologists. "It is not possible to predict when, where and the magnitude of an earthquake," says V K Gaur, a renowned seismologist with the Indian Institute of Astrophysics, Bangalore. Through extensive mapping of the Earth plates, there is data to suggest where earthquakes are likely to strike, but scientists are yet to predict the exact location and the timing. The only instance when an earthquake was accurately predicted was in China in 1975 (see box: Never again). However, the same team of scientists failed to predict another earthquake a year later. The us National Earthquake Prediction Evaluation Council in Washington dc -- considered the world's largest network for earthquake prediction -- which reviews such predictions, has yet to evolve a useful method for predicting earthquakes though it has made several such attempts. The focus of research now is on 'forecast', which means specifying occurrence of an earthquake for a specific time period, to develop a system of early warning so that damages and human casualty can be minimised. Some scientists, however, do agree that the major earthquakes give enough indications and follow a clear 'spatial pattern'. "Prediction is akin to an astrologer's pronouncements. We should monitor the micro-seismic activities that indicate the magnitude and place of future earthquakes," feels Soumitra Mukherjee, associate professor at Jawaharlal Nehru University's school of environmental sciences, New Delhi, who is also doing research on the impact of sun spots on the Earth's seismic activity. "Prediction is not possible. The answer is quake-resistant houses," says Harsh K Gupta, director, National Geophysical Research Institute (ngri), Hyderabad. Worldwide, about 18 earthquakes of the magnitude of 7.0 or larger occur each year. Most of these take place on long fault zones around the margin of the Pacific Ocean. The reason is the Atlantic Ocean is growing a few cm wider each year, while the Pacific is shrinking. Therefore, the ocean floor is pushed beneath Pacific Rim continents, according to a report of the University of Washington's geophysics programme. "Such research helps us understand the Earth's crust. But for a clear picture, we need further micro study," says Mukherjee. India has a visible network of centres to study and predict seismic activities, particularly in the Himalaya. Way back in 1982, the Earth System Science division of the department of science and technology did a six-year study of the Himalayan region. Its mandate was to locate probable source points of an earthquake and forecast earthquakes. The project worked with a dozen reputed institutions such as the ngri and the earthquake engineering department of the Roorkee University. But the findings could not offer a fresh insight. It only reinforced an earlier study of the tectonic activity in the Himalaya, much of which was mapped by the British during the 19th century. Earthquake-prone countries such as Japan, China and the us are now minutely studying seismic zones to calculate earthquake strike periods based on the behaviour of the Earth. The very anatomy of an earthquake shows that despite all the gloom involved with earthquake prediction, a major earthquake cannot take place without sufficient deformation to yield the energy released by the earthquake. "An earthquake is the release of accumulating stress in the Earth's continental plate that builds up for over hundreds of years," says Gaur (see chart: Declared arrival). Recent studies confirm that the build up of deformation before a large earthquake can be monitored. For this, seismologists use geophysical precursors such as uplift and tilting of the ground on the surface and release of radon gas to monitor changes in the physical state of the Earth. These precursors enable scientists to make medium and short-term forecasts of an earthquake. The timing of the warning depends on magnitude of the impending earthquake. For example, for a 3.0 Richter earthquake, there is a day's warning. But for a 4.0 Richter earthquake, the time period is about 10 days; for a Richter 6.0 and 7.0 earthquakes, the time frame is one-two years and six-seven years, respectively. For a Richter 8 earthquake, we would have at least 25-30 years to forecast a time period. However, D K Paul, head of the Roorkee University's earthquake engineering department says, "Not all of the precursors have helped completely in predicting earthquakes." Indian prediction systems use theoretical assessment of the plate movements and the average time in which an earthquake visited a specific place in the past. Almost all studies are focussed on the Himalayas, though we now have the capability to use satellites for more accurate study of the plates. In Japan and the us , global positioning systems (gps) are used through satellite for studying the movements of the plate and detecting any change in the topography of seismic areas. There are 2,500 gps stations in Japan and even a minor change in the seismic active zone is immediately observed, thus giving scope for analysis. Similarly in California, a network of satellites and gps stations scan every part of the region for seismic movement. Scientists in Japan and the us have identified faults and are mapping them to understand their character. This helps in issuing a warning when there are visible symptoms of seismic activity. Though forecasting seems easy for well-understood faults in India, such as the Himalayas and the Kachchh areas, not much effort has been made to map them. This is where Indian establishment has failed, though it is home to one of the world's most active seismic zones. Bhuj is in the Zone V category, the highest danger category. But there is not a single gps station. The seismic observation centres in the town were so badly damaged during the quake that it could not register its magnitude. Bhuj is also near Allabund (wall of God), a 90 km long wall of Earth created during the 1819 earthquake. Its extensive study would provided much insight into the Indian plate that is barging into the Asian plate. But due to its proximity to Pakistan, the government never allowed an extensive survey. "We have lost valuable time to study the region," says a senior official at imd. The imd wrote to the Union government at least 45 times for permission to survey the region. In 1997, a field survey was commissioned. But not much is known about its findings as the Thiruvananthapuram-based Centre for Earth Science is still analysing the data. Experts believe that Allabund might have caused the earthquake as it sits on several dormant fault lines. Bhuj is located between the Nagarparkas fault line in the north and Kathiawar fault line in the south. "Old and dormant fault lines passing through Gujarat might have caused the earthquake," opines Sachinath Mitra, a professor of geological sciences at Jadhavpur University, Kolkata. In the absence of a micro study of the seismic area, seismologists do not know exactly whether fault lines are dormant or inactive. In California, a micro study discovered many new fault lines thus warning the authority for to be more aware of its crisis. But intensive studies have never been conducted in India. "We need to micro map our seismic zones throughout the country," says Gupta. One research paper (Current Science , February 1998) says that India has much more active seismic zones than earlier believed to be. "India is rotating relative to Tibet and also to the Australian plate according to gps instruments observation from Bangalore. The plate tectonic theory assumes rigid undeformable plates separated by mobile collisional zones. Yet seismic activity within the Indian plate is significantly higher than in many intra-plate environments and moderate earthquakes are common," the report adds. The theory goes that recurring small earthquakes are not sufficient enough for the release of energy generated due to the constant barging from the Indian plate into the Euroasian one. It would require a 7.0 Richter earthquake recur every few years along the Himalaya to release that energy. But the recurrence interval for such events, called seismic gap, is several decades. There is a strong probability for more than one 8.0 Richter earthquake in the Himalayan region this century, warns the report. India's Northeast region is the world's sixth-most seismically active zone. In the last 150 years, this region has been rocked by 22 earthquakes, all of them with a magnitude of above 7.0. Some years ago, the Assam government came up with a scheme to sponsor its students to study seismology at the Roorkee University in the hope that they would come back to help the state's civic bodies in times of an earthquake. For some strange reason, the government recently discontinued this scheme. "Every tremor could well lead us to a bigger earthquake," says Gaur. His research paper, in fact, has indicated some geophysical precursor like deformation of the seabed in the Indian peninsula. Says Paul: "We need to listen to each and every activity happening below the surface to estimate the real threat from seismicity. Without micro-observation, there cannot be further breakthrough in earthquake research." With the recent earthquake coinciding with some tremors in Kerala and Tamil Nadu on January 7, seismologists anticipate a major earthquake in south India. "The slow rate of deformation of southern India is typical of an intra-plate environment and suggests that earthquakes should have a renewal time of several thousands years," says Gaur. Oil rich Godavari basin is in Zone III. "Areas along the coast line like Anantpura and Chittor located on the western side of Chennai and areas falling within 100 km on either side of Godavari are vulnerable to quakes," says P K Rastogi, deputy director of ngri . "We need to study these signals so that an authentic estimation can be made," explains Gaur. After the Latur earthquake in 1992, the government initiated a move to remap the seismic zones of the country as Latur was in a rather seismically calm zone. Even in case of Gujarat, Rajkot falls under Zone III. The remapping initiative seems to have remained another bureaucratic exercise. In the aftermath of the Gujarat quake, there is already a proposal to club Zone IV and V into one group thus dividing the country into four zones, instead of the existing five ones. In a similar step in 1965 -- when the country was divided into six zones -- Zone V and VI were clubbed together. "Without an updated seismic zones map, you can't even think of preparedness or say implementing an earthquake-resistant construction code," says V K Mathur, director of the Central Building Research Institute, Roorkee. T he Gujarat earthquake has proved that even in the highly seismic zones like Bhuj, Uttarakhand and the Northeast, our preparedness and crisis management is a monumental failure. Bhuj is one of the 13 hotspots on India's seismic hazard map that was prepared three years ago. 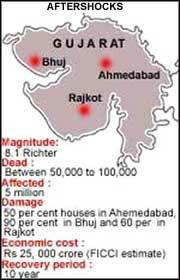 The assessment was that Bhuj might experience earthquake with a maximum magnitude of 8.5 in 50 years. The assessment never got incorporated into the nation's crisis management programme. "We are a nation with a casual attitude," says Gaur. Analysts feel that the nexus between builders and contractors and corrupt local bodies officials, responsible for these unsafe buildings, ultimately became the death trap for thousands in Gujarat. " The damage to buildings is due to the shock as well as the poor building materials, poor construction methods and large-scale flouting of building bylaws and regulations," says Mihir Bhatt, honorary director, Disaster Mitigation Institute, Ahmedabad. "I have not seen a single building with any earthquake resistant feature in these areas. I don't even think that the officials concerned have any idea about the area's seismicity," says Mathur. In Kachhch district, 70 per cent of the buildings were not earthquake-proof. "It shows that building design norms were violated rampantly," says V Suresh, chairperson of hudco . In Ahmedabad, more than 75 new high-rise buildings collapsed, while the local authorities pulled down another 20 as they stood precariously. Most of these buildings did not have earthquake-resistant features nor built according to the guidelines laid down by Bureau of Indian Standards (bis). Interestingly, 300 flats built by the Gujarat Urban Housing Development Corporation survived the quake as they were designed to resist earthquake. According to town bylaws in Bhuj, only two-storey buildings are allowed. But high-rise buildings came up and 90 per cent of Bhuj's new buildings were reduced to rubbles in just one minute. After the Jabalpur (Madhya Pradesh) earthquake, the Gujarat government made it mandatory for earthquake-prone areas like Ahmedabad, Rajkot and Bhuj to incorporate earthquake-resistant features in their house designs. But these measures were not strictly enforced. Contractors, for example, would earlier insist on using about 30 killogramme (kg) of steel per square metre of constructed space. But a competitive market brought it down to about 10 kg. India is probably the only country that has a vulnerability atlas that gives district-wise assessment of different hazards and risk involved with different constructions. This assessment was completed in 1988. India's each and every district has copy of this atlas and so details of designs that should be adopted in their respective areas. But everybody seems to have forgotten about it. "Everything has been written for a century, but there is no implementation," says Mathur. Delhi, which lies in seismic Zone IV (the second most active zone in India), and like Bhuj is situated on an intra-plate fault disturbance area, has experienced eight earthquakes in the past two years. However, the Master Plan perspective 2001 does not recognise the fact that Delhi lies in highly seismic zone. The recent assessment by the New Delhi Municipal Council (ndmc) and the Municipal Corporation of Delhi ( mcd) that 50 per cent of structures in Delhi are not earthquake-resistant is an indicator to the devastation that would follow an earthquake. The ndmc and the mcd don't have any structural engineers who have the expertise in designing earthquake-resistant buildings (see box: Capital shock). Some believe that making an earthquake-resistant structure is an expensive affair. However, researches from Roorkee University's Earthquake Engineering department have shown that incorporating features such as retrofitting old buildings does not cost much. Research shows that provision of lintel band and vertical steel reinforcement is very effective in imparting the strength and energy absorbing capacity to the building and the quantity of steel reinforcement as provided in the Indian code are found to be generally adequate. For two-storey structure, the additional features like lintel band and steel beams incur an extra cost of two-five per cent. Retrofitting an old building would be about 25 per cent of the cost (see box: Solid foundation). With the death count rising, both the state and the central governments are struggling to coordinate relief efforts. At an all-party meeting, Prime Minister Atal Bihari Vajpayee declared the formation of a national disaster management committee comprising 'experts' and another committee comprising politicians. The government also promised to remap the seismic zones and to take up satellite-based study of the zones. Knee-jerk responses, and not long-term solutions. The fact remains that similar promises were made earlier too. A committee is preparing a blueprint of a national disaster management plan and another to draft a National Calamity Management Act, that would give more power to the district magistrate during a crisis. If this is the change that the government wants, then the district magistrate already has enough power to fight a disaster. More power begets more corruption. As far as remapping the zones is concerned, the proposal has been making the rounds since the Latur earthquake and some seismologists have the map already. The government is still in comatose, hope it doesn't die. Gujarat has already seen enough deaths.